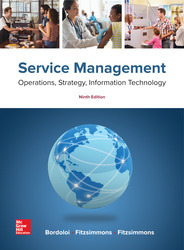 • Emphasizes the essential uniqueness of service management. • Covers historical context and the service enterprise supporting competitive strategy, managing service enterprises, and forecasting and managing service inventory. • Includes updates on recent advances in data analytics and the Internet of Things (IoT), an extension of the Internet into our everyday lives.